The benefits of exercising are endless, there is no doubt about it, but have you managed to find your inner motivation to hit the gym or engage in some outdoor activity? If the answer to this question is “not yet,” you will certainly change your mind after reading this. Besides losing weight or building muscle, physical activity is good for you in more ways than you can imagine. 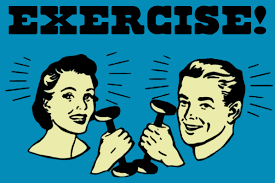 A little daily exercise, either inside or outside, can do wonders for you. It will help you gain a better posture, improve your memory, boost your confidence, help you de-stress, be more productive, live longer and simply be happier. When deciding your workout program, it’s important to keep a balance between indoor and outdoor sessions, as this is a great way to avoid routine and boredom and keep exercising exciting. Sometimes, it’s impossible to go outside, especially in the winter months, so you will have to do with some indoors activities. You can either hit the gym and take advantage of the equipment there or practice some home exercises such as jumping rope, stair stepping, dancing or following some YouTube workouts. In summer, however, it would be ideal to mix up your fitness routine by also engaging in some outdoor physical activity. After all, exercising outdoors may improve energy levels and decrease stress to a greater extent than working out inside. Outdoors, for instance, there’s more variety when it comes to the type of activity you can do: surfing, trail running, rock climbing, bicycle riding, or even aerobic. Moreover, many types of outdoor exercise are free such as running, hiking, and swimming. The beautiful thing about running outside, for instance, is actually its simplicity, as it does not really require sophisticated gear or equipment. It’s basically just you and the open road ahead. The most important thing is to find a routine you truly enjoy and stay motivated so your that workout doesn’t feel like work.